We believe all beings need a SAFE PLACE to heal... Dove Creek is that place. 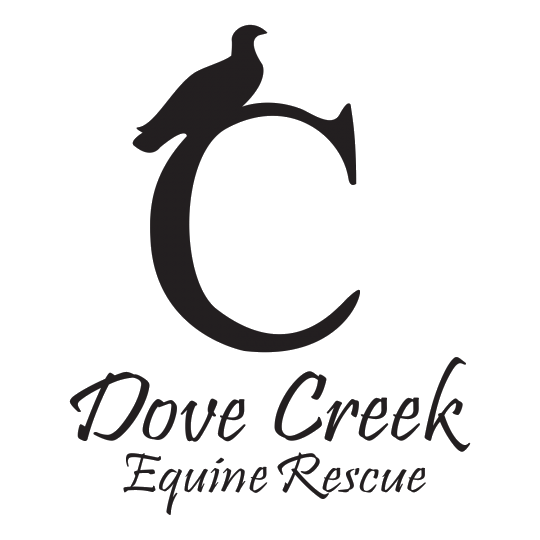 Our mission at Dove Creek Equine Rescue is to Rescue. Rehabilitate. Retrain. & Re-home horses in the Texas panhandle who have been abused, neglected, abandoned, or surrendered. Through education on responsible horse care, we provide a foundation for horses and humans to be in partnership, creating positive change in our community. We believe all beings deserve to have dignity - the state of being worthy of honor or respect. Some horses and barnyard animals never leave due to injury or old age and most of these will need medical care. We call these horses "Sanctuary Horses." They are often the "forgotten, no good, not needed anymore, crippled, too old, useless" to name a few of the expressions by some. And then there are the owners that are greatly saddened when they can no longer care for their beloved equines when they call to surrender him or her. These horses are many times former performance horses or working horses, having given their best for many years for their humans. At Dove Creek, we love them all and care for them until they leave or pass over the rainbow bridge. Please consider sponsoring at any level if you can, and help out one of our beautiful "Sanctuary Horses" or "Barnyard Animals."